My house is built on contaminated land, what can I do…? In the past houses were often built on contaminated land that was neither cleaned up properly or indeed at all. So it is no wonder that home owners are devastated to learn that their homes could be worthless and they are at risk when in the garden and eating their home grown veggies. But all is not lost. The first thing to do is to determine if the contamination causes a problem and if so to whom or where, see our blog for more info . If the contaminant is an organic, such as oil, diesel, etc. then there are several tried and tested low impact methods to remove it from the soil, but if it’s an inorganic, such as lead, zinc, copper, etc then an engineered solution will be required. For around homes this normally entails excavating and removing a 600mm (two spades depth) layer of the contaminated soil throughout the affected area but not under the house. Once this is completed then an anti-dig barrier, such as the yellow one in the picture, is installed along with a geo-membrane. This prevents the movement of particulates whilst allowing rain water to migrate down to the water table. Then clean sub and top soils can be imported to replace those removed and the task of re-landscaping can begin. Whilst this approach can initially appear quite intrusive it is relatively straight forward and can be undertaken quite quickly with little fuss. A plant rescue can easily be undertaken for all those treasured specimens along with dismantling and reusing sheds, greenhouses, paths, etc. One concern to residents is when a beloved pet has been buried in their garden. 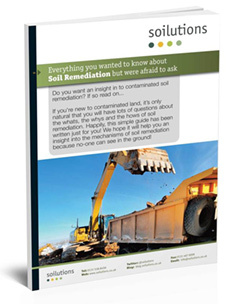 Often in these situations that small amount of soil can be allowed to stay…! Why not have a look at our case study where we undertook the above works or give us a ring for a confidential discussion.